Yesterday, June 10, the Congregation for the Doctrine of the Faith published the above document. See it here: CDF document. It provoked a storm of protest from non-Catholics and secular media. Most assuredly it did not sit well with cafeteria Catholics who have embraced relativism. Yet, the document said nothing new. It simply restated the age old belief that the one, true Church subsists only in the Catholic Church. The two crucial linch pins of this are apostolic succession, which traces the Church in an unbroken line back to Christ and the apostles, and a unity with Rome, the see of St. Peter. 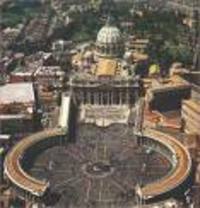 The basic teaching is that the one Church of Christ subsists fully only in the Catholic Church. Elements of the Church are present and operative in other churches and ecclesial communities (the Protestant groups), but not fully. Yet, Christ can use those communities as instruments of salvation. It's kind of technical, but that's why the teaching of the Church uses the word "subsists" instead of "is." Parts of the Church's elements of sanctification of truth are found outside her structure. In other words, there is great value in other denominations, but there is not the fullness of truth. Look, if you believe that truth is relative, that is, we can make our own truth, then you will have problems with this document and this teaching. But like the X-Files says, "The Truth is out there!" Not in me. As Catholics, we do not believe in multiple truths. What many in our culture aren't going to like about this document is that it seems to say that Catholics are better than anyone else. Nothing could be further from the truth! On the contrary, because we possess the fullness of the Church, we need to act with more faith, more virtue, more courage--we have to behave more responsibly because of the tremendous gift we have been given. This leads us to humility, not pride. Yet, relativism says that man can make his own truth and his own god. Many believe that one religion is as good as another. We reject that notion because it is simply a variant of the temptation in the Garden of Eden, namely, that we ourselves can be gods, we ourselves can create truth. We cannot. A lot of sturm and drang, sound and fury, in the media over all this. But the Pope is just proclaiming what the Church has always proclaimed. The blinding light of Truth can be painful, but at least it's Light rather than the murk and muck of grey ambiguity and confusion. Thanks to Pope Benedict for restating what it is we truly believe.